Solar energy is not available at night or on cloudy days. Sometimes, wind does not blow strong enough (9 mph). There are many proven-and-emerging technologies for storing excess energy for use any time of day. The "best"
storage technique depends on the type of energy. A minimum number of energy-type conversions should be required. days or weeks. High temperatures (in the 1,000 degrees F range) can be stored in molten salts for a day or so. Wind-drive compressors can store compressed air indefinitely (in deep wells and high-pressure gas reservoirs). It can be used at any time to generate electricity, and also for cooling (at the same time) as the pressure is released. There are many ways to store electricity (from any source) for long periods of time until needed for peak loads. the late 1800's. 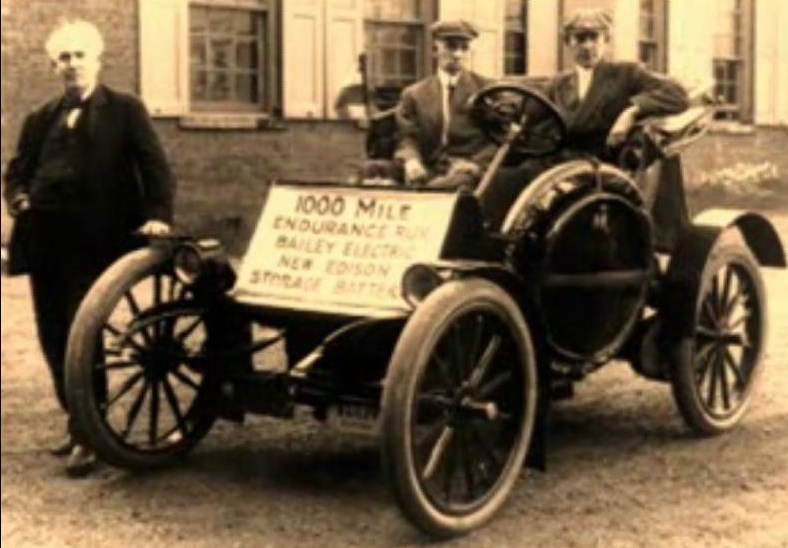 Thomas Edison developed storage battery technology for 1890’s electric car 1,000-mile endurance race. is currently sufficient, but not as cost-effective as we expect it to be when we are ready to occupy Emerald Eco-City. benefit of consumers around the world (enhancing USA exports, and our international balance of trade). 6 Megawatt 8-hour electricity storage system for Tokyo Electric Power Company . We expect many electricity storage innovations soon. being stored and generated in this way today. We understand the associated energy storage economics very well. design optimization will be required when we make the final decision about where to build on available land. could be built miles away from our city. Wind energy could be collected in mountain passes, and stored in the reservoir. is needed (when solar power is not available at night, on cloudy days, etc.). Another way to store energy with gravity is a massive weight (like a very-large-scale version of a grandfather clock weight). Calculations to properly size one-or-more such systems for on-demand power as needed. This may be cost-effective in some very-flat locations where a water-reservoir system is less feasible, but the gravity-storage principle is similar to water. There are many unexplored creative high-and-low-tech ways to store energy for 24-hour-a-day usage whenever needed. The unprecedented scale of Emerald Eco-City will allow us to investigate the most-cost-effective methods conceivable. We will implement multiple evolving alternatives and publish our performance monitoring data for worldwide refinement. medium in a decade. Hydrogen is the most-abundant element in the universe. It is the source of the sun's fusion energy. because hydrogen has a high energy density per unit of mass (weight). that new nano-technology research (which we will support) will make hydrogen production inexpensive and pervasive. atmosphere to combine with oxygen to form various harmful nitrogen oxides (NxOx), which are powerful greenhouse gases. Some byproducts of combustion (like nitrogen dioxide - NO2 - a component of common smog) are very poisonous. The future of using hydrogen for Clean, Emerald-Green 24 / 365 Energy Storage is the Hydrogen / Oxygen Fuel Cell. solar energy for use when the sun is not shining. which will obviously provide worldwide benefits to us all. We plan to remain on the leading edge of energy technology.